Art historian David Getsy and performance artist Lin Hixson discuss the ways in which artists in Destroy the Picture: Painting the Void, 1949–1962 responded to their confrontation with the blank space of the canvas. Focusing on material gesture and bodily engagement, they examine how gender factored into their destructive acts of creation. I attended this event. It was fantastic. When I initially reviewed this exhibition, I got very caught up in the narrative of “global cultural recovery from atomic era existential crisis.” Getsy and Hixon were able to give insightful perspective on the presence of the artists’ body and greaturl historical context in the creation and understanding of the works. 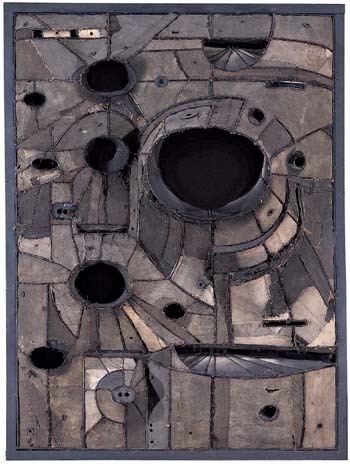 I especially appreciated Getsy’s reading on Lee Bontecou. In his interpretation, Bontecou is not a dark, passive void, but a woman’s assertion of agency in the male-dominated landscape of abstract expressionism. He also cites her use of appropriation– of militarized landscapes, and used/found materials– as a kind of reclaiming and reconfiguring of a violent culture. Hixon emphasized the importance of collaboration in many of the works. A really engaging evening.